Three Treasures Yoga believe in a yoga that is rooted in its history and traditional teachings, accessible and relevant to the present, and useful to the need of each individuals growth and development. Through this interdisciplinary portal, they strive to inspire curiosity and a deep dedication to learning in students. Three Treasures Yoga teach a strong foundation of the eight limbs of Classical Hatha yoga and offer an authentic base of knowledge from which students can investigate intelligently and creatively, the ever-changing face of yoga in a modern world. The Cattebio is divided into four different buildings La Villa, Canaletto, Filosofia, and La Guardiola. La Villa has two suites on the first floor, each having their own bathroom and three bedrooms on the second floor with shared bathrooms. This villa can accommodate up to 10 people. Casaletto has two rooms, each with its own bathroom. It can accommodate up to four guests. Filosofia has one suite with bathroom and can accommodate two guests. La Guardiola has two bedrooms each with its own bathroom and can accommodate up to four. Each building has a common area and porch. The four houses are surrounded by a park with beautiful trees and shady areas. Near the park, you will also find the swimming pool (15 x 4 meter) which is situated in a magnificent spot. Chestnut trees, olive groves, vineyards, and orchards which are all biologically grown, enframe the estate. All the houses have central heating and there are several fireplaces in the lounges and salons. All courses include the teaching of basic yoga principles, including postures (asana), meditation, breathing exercises (pranayama), chanting, and the basics of yoga philosophy and nutrition. Courses have been developed by Virginia Wood, Massimo Cantara, and Molly Cofman; the classes draw upon the traditions and teachings of Hatha yoga, Dynamic yoga, Iyengar yoga, martial arts, healing techniques, bodywork, and traditional Chinese medicine. Being a dedicated student is the key to successful teaching. While many entering this program go on to be successful teachers, many enter the program to simply deepen their own investigation and experience of yoga. Teachers come from three different yoga lineages, providing different perspectives on the wisdom and teachings of yoga. In this way, students ability to see the same situation from many different perspectives is being fostered. This is a good foundation for intelligent and creative investigation. The exploration of the traditional practice is done in a way that honors the pure tradition, but also elicits an investigation that makes the practice relevant and realistic in our modern world. Healing modalities and healing touch are taught to familiarize students with the physical body. In this way, students become more adept in their own healing processes, as well as being able to facilitate more knowledgeably for others. In addition, students have the opportunity to have at least one private session with teachers who are certified in shiatsu, traditional Chinese medicine, and other healing modalities. Cattebio, the Tuscan villa at which this summer training will be held is a stone's throw from one of Tuscany's largest and most beautiful thermal baths, Saturnia. On days off, you can spend the day at Saturnia, or visit the beautiful nearby towns of Pitigliano and Sorano. You may also simply decide to stay on the property and relax on the lawn, take a dip in the pool or hike around the surrounding hills. Massimo lived and studied in England for over 10 years, speaks fluent English, and is a member of Three Treasures Yoga. He is a registered yoga teacher with Shiatsu yoga Mediterraneo as well as a professional Shiatsu therapist and teacher. He is also a qualified kinesiologist and craniosacral therapist. In 1999, he founded Holismos, a center for yoga and complementary therapies in Poggibonsi, Tuscany, Italy. He also teaches anatomy, physiology, and bodywork for yoga teacher training. Molly completed her Master of Science in Oriental Medicine at Pacific College of Oriental Medicine in Chicago. She also holds a Bachelor of Science in Ecology and Evolutionary Biology and a Master of Fine Arts in Theater Arts and Dance from the University of Arizona. Molly was introduced to yoga in 1993 in Tucson, Arizona while on a journey to keep herself healthy as a dancer. Although incoming from a dance background, she connected immediately with the asana practice, Molly found herself intensely inspired to learn more about yogic philosophy. In the heart of Tuscan Maremma, defined by its unique hilly landscape which extends down toward the Tyrrhenian Sea, Catebbio sits atop a hill and offers rustic tranquility. High above the valley of the Fiora River with its unrefined canyons and its copper gleaming Etruscan towns of Sovana, Pitigliano and Sorana and among the lush green olive groves lies the magnificent country estate and seminar house Cattebio. With its beautiful secluded location at a height of 500 meters and its unique panoramic views, it is a treasure with the nobleness of old Tuscan manors. All the elegantly decorated rooms of the four houses of Cattebio with a total area of 600 square meters invite you to enjoy the breathtaking view of the Tyrrhenian coast and the islands Elba, Giglio, Monte Christo, and the sophisticated Argentario. Yoga will be practiced on an outdoor wood yoga deck adjacent to La Villa. The deck provides breathtaking views of the surrounding valley and the Tuscan landscape. It is also a beautiful place to watch the sunset. All meals are cooked on the premises and are organic and vegetarian and offer a glimpse of traditional Tuscan and Italian cuisine. Water, coffee, tea and fruits are provided throughout the day. Please note that spas are within a 15 minute drive from Catebbio. Also, you need to book the excursions and wine and cheese tasting. Kindly send a query to Three Treasures Yoga for further information on same. On site massage and treatments available. Transportation to and from the yoga teacher training is not included in the price. The closest airport is Leonardo da Vinci–Fiumicino Airport (FCO). The closest station is Grosseto. Pick up and drop can be organized by Three Treasures Yoga for an additional fee. Airport: Leonardo da Vinci–Fiumicino Airport Airport transfer available: Leonardo da Vinci–Fiumicino Airport (US$45 per person) Additional charges may apply. You can request this in the next step. Airport: Florence Airport, Peretola (Amerigo Vespucci Airport) Airport transfer available: Florence Airport, Peretola (Amerigo Vespucci Airport) (US$45 per person) Additional charges may apply. You can request this in the next step. 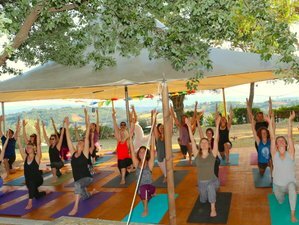 Three Treasures Yoga is a Yoga Alliance certified interdisciplinary yoga school located in Italy. They feature yoga training programs with different lineages.